Data centres are the physical building blocks of the digital economy. For the past 30 years, this special class of building has exploded in number to keep pace with the growing business requirement to house data and computing capacity. In 2017, there were an estimated eight million data centres around the world – most enterprises use at least one data centre, which they either own directly or rent from a third-party provider. Among myriad data centres, there is a very small category that plays a critical role in enabling the global exchange of data traffic, which essentially underpins the digital economy. Carrier-neutral data centres – also known as ‘interconnection hubs’ – emerged more than 20 years ago, with the advent of the internet. Interconnection hubs became the neutral locations where telecommunications providers could interchange IP traffic to reach end users. Initially relatively small, these purpose-built data centres were historically located in major metropolitan areas in order to serve communities with a high concentration of people and a strong GDP. The need to exchange traffic with as many parties as possible within the same location has given rise to the construction of one or two interconnection hubs in every major city in the world. Further, successive waves of innovation, such as e-commerce and digital media, have led to exponential growth in the amount of traffic exchanged, which, in turn, has greatly enhanced the strategic importance of these facilities. Today, all the biggest companies delivering digital services have a presence in the main interconnection hubs around the world, as it allows them to connect to one another and route their internet traffic to end users in the most effective and efficient way possible. 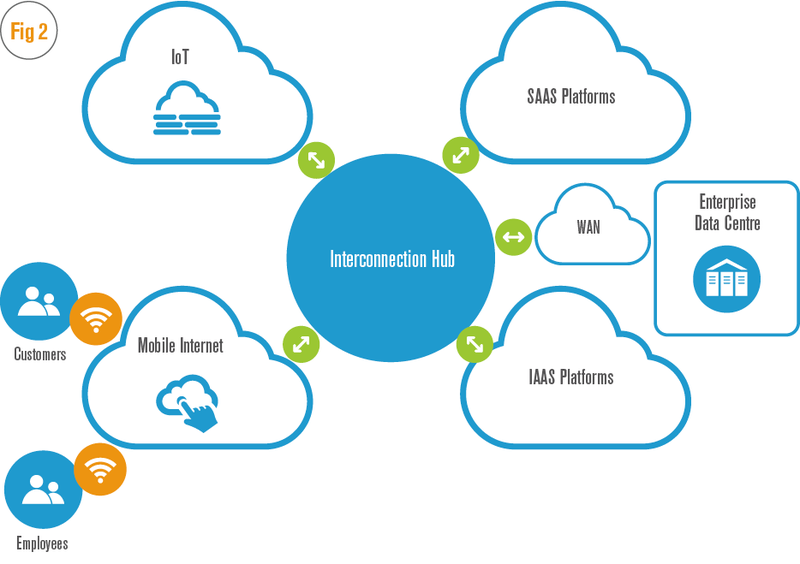 And now that cloud and mobility have become the pillars of any modern enterprise IT architecture, establishing a presence in one of the major interconnection hubs has become a must for businesses aspiring to thrive in the digital economy. With the advent of cloud and mobility, two things have fundamentally changed in enterprise IT architecture. The first is that any organisation serving its customers through online applications must now employ a much larger pool of communications providers to deliver a superior end-user experience. The second change, meanwhile, has required businesses to adopt one or more public clouds in order to reduce their capital and operational expenditure. This, in turn, has forced them to find a secure and reliable mechanism that can access such services without breaking the bank on connection costs or exposing corporate assets to the risks of public internet. Interxion is one of the few companies that operates these neutral interconnection hubs in Europe. Since its inception in 1998, Interxion has focused on building data centres in locations with the greatest demand for interconnection. The company has since expanded its presence to 13 major Western European cities across 11 countries, and now operates 50 data centres that serve more than 2,000 customers. Ruberg has been at the helm of the company for more than 15 years and has served as CEO for the past 10. He joined the industry when it was still in its early days, having foreseen the critical role that interconnection hubs would play in enabling the global expansion of the internet. Throughout his tenure, Ruberg has overseen a steady growth in revenue, profit and customer base – but, more importantly, he has also built a customer-centric culture obsessed with delivering superior quality of service and the best possible value. “Interxion’s core vision is to be at the heart of the global digital economy, enabling customers to enhance their value proposition by effectively interconnecting their businesses within their communities of interest,” Ruberg told European CEO. Participating in communities of interest is the principal value proposition for companies that choose to work with Interxion. These organisations are characterised by being highly interconnected with their customers, business partners and suppliers. Consequently, they benefit greatly from being present within interconnection hubs – into which all internet traffic flows. All the leading providers of public cloud services have deployed private cloud access nodes to enable enterprises to access their services in a secure and reliable way. For this reason, a subset of neutral interconnection hubs has evolved to become neutral cloud hubs. As the leading operator of cloud hubs in Europe, Interxion offers companies access to all of its major platforms across the 13 cities in which it operates. “The emergence of neutral hubs represents a terrific opportunity for enterprises that have embarked on their journey to digitalisation in order to increase business agility, enable new business models, improve customer experience and reduce costs,” Ruberg said. Today, more and more enterprises are adopting IT models based on a hybrid cloud architecture. In such cases, some workloads are kept in traditional on-premise data centres, while others are moved to the public cloud. In a hybrid model, the benefits of having a presence in Interxion’s data centres extends beyond secure access to the public cloud. In a scenario where applications are dispersed across different physical locations, connecting different workloads and datasets with the associated security, performance and service-level requirements creates a new networking challenge for enterprise IT teams. Traditional enterprise network architecture relied on a corporate wide area network (WAN), which was typically designed to connect a company’s data centres and offices. In this model, the enterprise data centre is the hub within the corporate WAN and hosts most, if not all, private applications and data. The traditional network topology (see Fig 1) is still the norm across many enterprises. It was, however, constructed for an on-premise workload placement strategy. With the emergence of cloud services – and with both customers and employees accessing mission-critical applications through mobile devices – this architecture is rapidly becoming obsolete. As such, enterprises that are embracing digital transformation are now rethinking their networking strategies. Essentially, they are expanding their network architecture to include interconnection hubs at the edge of the corporate WAN, where they can gain private access to cloud services, while also establishing private connections to customers, business partners and suppliers (see Fig 2). Since more companies are expanding their presence within Interxion data centres, enterprises are not only reducing the cost of their network infrastructure, but are also dramatically improving the performance of their applications by having direct access to other entities that are located in the same facility. For instance, organisations that serve their customers via online applications benefit from being co-located next to mobile operators and internet service providers. Meanwhile, enterprises that burst their hybrid cloud applications into one or more public clouds benefit from being co-located within their cloud platforms of choice. As more organisations choose to deploy their workloads in such locations, being co-located dramatically reduces the cost and complexity of their digital service delivery and supply chains. 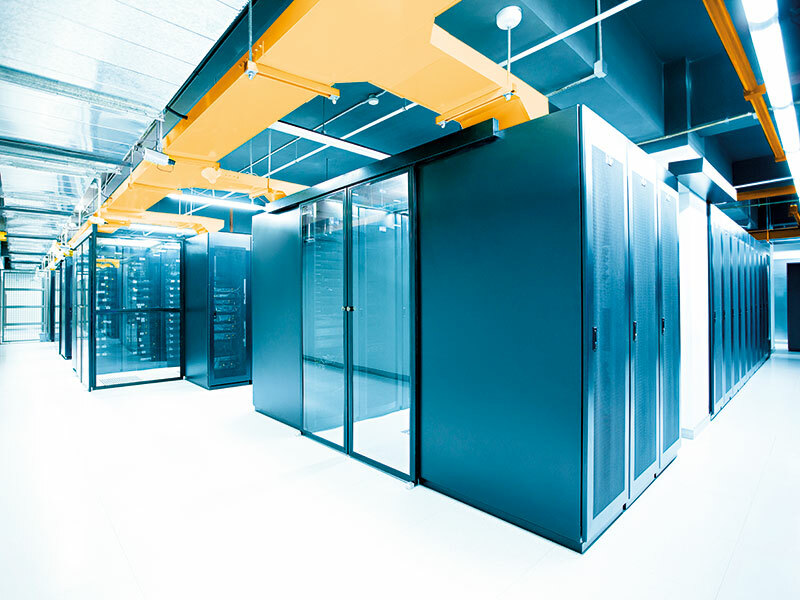 Co-location in a multi-tenant data centre has always been a good option for enterprises, but it was only really considered when their IT footprint did not justify building their own data centres (or occupying a dedicated third-party, single-tenant data centre). For digitally dependent enterprises, gaining access to the right co-location provider is key to achieving a successful digital transformation. This is largely due to the fact that they become just a short connection away from other organisations’ workloads and IT infrastructure providers. Historically, only certain categories of enterprise workloads have benefitted from being in close proximity to one another. One example within financial services is high-frequency trading, which requires deployments close to the central trading platforms. Today, entire sectors, such as banking, insurance, healthcare, retail, transportation and manufacturing, are embarking on digital transformations in order to remain competitive in their respective fields. As companies embrace the benefits of integrating into the fabric of the digital economy, it is likely that co-location will be embedded in any future IT architecture that manages massive volumes of data flowing from customer devices to back-office systems. As Ruberg explained: “Cloud migration is the first step in the journey. This is because selected workloads are more effectively deployed in the public cloud while legacy applications remain tethered to their existing environment, giving rise to the current incarnation of hybrid environments. With these tools, enterprise IT is set to modernise its architecture to make optimal decisions that are based upon workload placement, cost, performance and customer experience. A key criterion when choosing a co-location provider is the access it provides to communities of interest. The larger the number of customers, suppliers, business partners and service providers that an enterprise can connect to in a third-party data centre, the more valuable it will be for them to deploy infrastructure in that location. 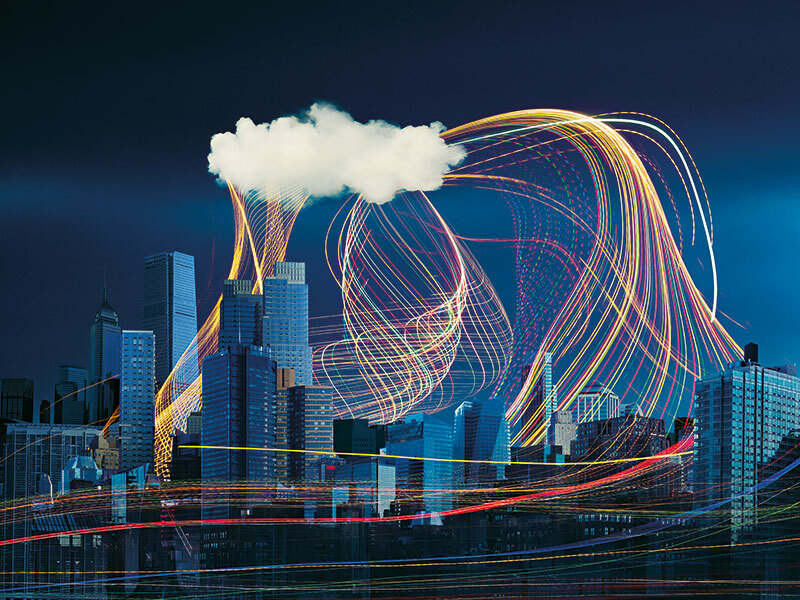 For this reason, neutral interconnection hubs – like those operated by Interxion – are emerging as the most successful co-location providers for the digital transformation. Another key customer requirement is operational excellence, as the companies that participate in the digital economy rely on data for mission-critical and real-time applications. Interxion’s facilities take the form of state-of-the-art data centres, designed with the highest standards of efficiency, security, availability and resiliency in mind. The power, efficiency and ‘eight-nines’ statistical availability of the company’s standardised data centre design, together with the efficient use of capital for construction, have been leading the industry for many years. As Ruberg was quick to add, these factors have also contributed to Interxion’s above-industry-average customer satisfaction rating. Interxion is also an industry leader in sustainability – an area that has become a widespread societal concern and customer requirement – operating 100 percent of its data centres on green energy. “In today’s world, where data centres consume a significant and increasing proportion of energy, it is of paramount importance to strongly embrace sustainability as a key principle of doing business,” Ruberg said. Operational excellence does not only derive from Interxion’s facilities, however: with more complex IT architectures depending on interconnection hubs, customers can rely on Interxion to provide flawless operational support 24/7. This, in turn, allows companies to optimise the experience offered to their own customers. At present, Interxion is in the process of evolving its service delivery framework in line with the IT Infrastructure Library, a set of best-practice principles used by numerous IT organisations around the world. The end result will be a service delivery framework that meets customers’ service-level agreement expectations, while still optimising efficiency. By leveraging standards and the latest toolsets available in the market, Interxion connects even more intimately with the way its customers think about service delivery. This helps to further integrate Interxion’s services into customers’ digital value chains, and also accommodates the company’s continued growth. Interxion is enjoying great success at the moment: through its pan-European footprint, Interxion serves the largest proportion of GDP of any co-location data centre provider in Western Europe. But despite its leadership in the field, the company will not be resting on its laurels any time soon. Interxion continues to invest in new data centres, modernising the existing ones and strategically acquiring assets in highly connected locations, just as it has done in Marseille and Amsterdam in recent years. Ruberg foresees a great opportunity ahead, not only for Interxion, but for all the European enterprises embarking on a digital transformation journey: “In 20 years’ time, we will not be talking about data centres anymore. The entire digital economy will seamlessly operate on a globally interconnected data fabric.